Well, well, well, it seems that 52Quilters is off to a good start. After a quiet New Year's Eve with my family in Toronto, and a New Year's Day filled with chilling/eating/laughing with intermittent breaks of frantic packing (including fitting an A1 print and a 5 kilo Le Creuset casserole dish in my suitcase! ), I'm back in the UK, caught up on sleep, and starting to feel back to normal. ... except, when it came to sit down at my computer and get going on this blog, I suddenly felt a bit overwhelmed. I'm so excited for 52Quilters to get going, and it's been brewing on the back-burner in my mind for so long, but suddenly I'm feeling the pressure of giving it a good start. So I'll stick to what I know for now, and tell you a bit more about myself through a little shopping trip did before I left Canada. Now when it comes to buying fabric, I have to be a very careful shopper. Knowing myself and the slippery slope that lies between where I live and hoarder-ville, I made some rules for myself after completing my first quilt. In order to preserve my bank balance and respect the storage space available to me, I told myself I would only every buy fabric for specific projects. Never buying for "just in case" or "just because". b) Lights: I find it so hard to find interesting patterns that read as whites, lights, beiges, etc. so whenever I see these I allow myself to buy them. So you can understand why doing some shopping at The Workroom as a part of my week on 52Quilters is a real treat: because this week falls under rule 1, exception c: special occasion. Normally, when I go into a shop to buy for a specific project, I have my ideas all mapped out and I know exactly what I need to buy in terms of meterage. I keep a notebook with me with my sketches and rough calculations to make sure I know how much I need to buy (including contingency/margin of error). Sometimes I have a pattern mapped out, and find fabrics to match my ideas: sometimes I'm led by the fabrics, and buy what I need and let that define my design, but generally I tend to purchase just enough, plus a little extra in case of mistakes. This makes it sound like I'm a perfectionist/meticulous person, but really I am not! It is more that I'm very visual so I need to see my ideas, rather than needing to know the detail. Also, I almost never remember the binding. I always, forget and have to last-minute rush out to buy binding fabric to match a quilt... this is either because the binding is a bit boring to me, or because I'm too excited about the quilt top to think about the binding when I'm shopping. It's always in afterthought for me. Lots of choice (above) as well as lots of haberdashery and sewing books (below). ... and I made some 'special occasion' purchases. ...and a 14-piece stack of fat quarters of Indelible by Katarine Roccella. My IGMiniSwap partner used the Spirodraft print in what she made me for the swap and I just couldn't pass up the chance to buy some for myself. So that's my big fabric indulgence (probably for this year!) - I know I'll be using the 12-piece for my rainbow swap, but I have no idea what I'll use the Indelible fabric for, but because I almost never buy fabric without a project in mind, I'll just keep it on the back burner and enjoy the luxury of knowing there are many possibilities! I'm curious to know if you find my fabric buying regiment reasonable or horrific? I hope you might take this as a place to share your own buying habits/stash rules, please comment and don't be shy about sharing links to your own blog posts on a similar subject. I'm keen to know how other people shop for fabric. Sounds very sensible to me! Nice haul and lovely trunk! I've found my fabric buying has changed over the years. When I first started quilting (early 90s) I tended to buy fat quarters, whenever I found a fabric shop, without any thought of what they would be used for. There was a lot less availability back then though, certainly in the UK. I shop a lot less now, but buy in bigger quantities. My main shopping event is Festival of Quilts when I will buy several yards of fabric - I usually buy a yard piece of any fabric which really catches my eye. Again, no real plan but I know what I like and what I will use - and I find bigger pieces to be more use. Through the rest of the year I will buy as is needed for specific projects and this is normally to go with fabric I already have. I think ultimately we all have to buy what we have the money and space for!! My fabric buying style is similar to yours. For the most part I shop for fabric with a pattern in mind. 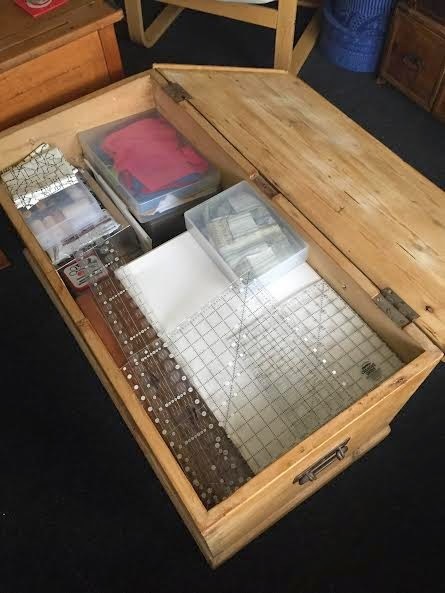 My stash is small compared to most quilters I know, but large enough that I had to organize it all the other day and weed out things I have kept and I know I will never use. These will be donated to the "free" table at our local quilt guild. And like you, I do indulge occasionally with some purchases of fabrics that I just can't pass up!!! You are doing a great job with the 52Quilters!!! Thanks for doing this!!! I like to purchase for a specific project as well, otherwise I think it would be easy for my stash to get out of hand with so much beautiful fabrics out there. I am a notorious over-buyer though, so I always have a ton of leftovers. And recently I fell in love with the La Passacaglia quilts, so I am being a little more loosey goosey with my purchasing and giving myself permission to stock up on all those "OMG, so cute for fussy cuts!" collections. Thanks for the comment Laura, I also have taken notice of La Passacaglia and recently tried my first (and very poor) attempt at fussy cuts. I love the idea, but the whole idea of fussy cuts stresses me out - potentially so much wasted fabric, just to get the right cuts. It's an entirely different approach to planning and thinking about fabric for me! Maybe I'll work up the courage for it one day! I'm loving this 52Quilters thing - really looking forward to following it through the year! Like the previous poster, my buying habits have changed through the years. I used to buy a half yard of anything I liked, period, and I liked pretty much everything I saw. Eventually, I realized I had tons of fabric that was dated, that I no longer liked, and I donated 14 boxes of fabric to a charity program. Lesson learned! Now I, too, plan before I buy (although the plans change, occasionally) and rarely shop impulsively. There are certain designers whose fabrics I always love, and I look forward to their sneak peeks of upcoming lines. And yes, I LOVE the precuts, particularly Fat Quarter Bundles and Layer Cakes! I admire your restraint. I agree that fabric buying is a slippery slope of which I'm constantly trying to stay afoot. I have quite a bit of space so I feel like it's ok to have a bit more on hand. Personally I love having a decent sized stash and being able to go straight to work when inspiration strikes. I live a good 25-30 drive from a decent fabric store so a good stash saves me time driving and whatnot. I'll admit that I have let it get out of hand of late. My goal this year is to work through some of my stash and let some go. So no buying this year with few exceptions. I'm allowed to buy for a project already started (say, if I run out of something I can buy more). But no buying for new projects. I have plenty to work with. Great post. Thanks for this Jennifer, distance to fabric is also a factor I consider but didn't post about. Whenever I'm on holiday, I treat it as a special occasion especially if I have access to fabrics I can't buy in the UK. Thank you for all your comments: please keep them coming. Such thoughtful and eloquent responses! For me, the thought of being able to just go to a quilt shop to get fabric I need for a quilt sounds like a dream! My fabric stash is now built in fits and starts whenever I visit a country that has quilt shops and/or quilt fabric -- previously Japan, Thailand, and that quilter's paradise, the US. I always have to balance what will fit in a suitcase without going over the weight limit and not break my budget, with the knowledge that I will be shopping my stash for almost all of my quilts. I wish I could plan out exactly what I need, but I have so many quilts in my head and am never sure which I will actually finally make. Sometimes when I go to an actual quilt shop, I find the abundance of beautiful fabrics almost paralyzing. So I just buy the fabrics I love and let that shape the quilts I end up making. Since I have been quilting since the 1990s and also having worked in a quilt store for a time, I have a significant stash. I marvel that yours fits in that beautiful trunk! My kind of impacts three rooms of our house to some degree. That being said, I have been slowly and carefully curating my stash, donating yards and yards of fabric that no longer excites me to the quilting group at our church, a group that donates quilts that are then auctioned every year with all the money going to a charitable organization that works in Third World countries. My goal for 2015 is to work with the fabric I already have, as much as possible, fabric that I HAD to have, which then was pushed to back of the shelf when some newer line became available. It is still beautiful fabric, I still love it, and this year I'm going to use as much as possible.